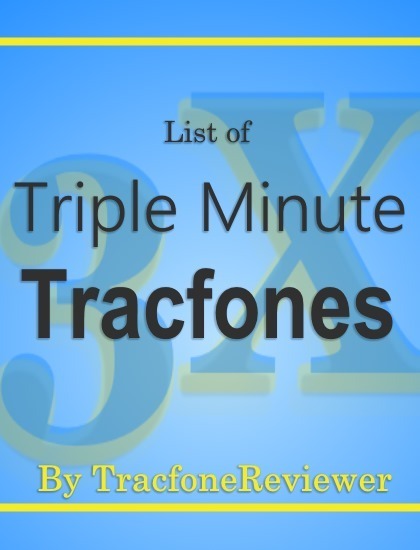 A list of Tracfone cell phones that come with Triple Minutes for Life conveniently organized by http://stephaniefulke.blogspot.com /">TracfoneReviewer for our readers to see which phones are the best deal on minutes. The way Tracfone prepaid service works is you buy airtime cards that come with certain amounts of minutes, like 60, 120 200 etc. So, for example. if you add a 200 minute card to your Triple Minute phone, you will get 600 minutes total (200 minutes plus 400 bonus minutes). And that's before you add a http://stephaniefulke.blogspot.com /p/tracfone-promo-codes.html">Promo Code! If you have a smartphone, however, things are a little different. Smartphones split up the Talk/Text/Data into three different pools. But, all Tracfone smartphones come with Triple Minutes, so you end up getting 3x Talk minutes, 3x Data and 3x Texts. We have several full posts providing further details on this including, http://stephaniefulke.blogspot.com /2014/08/how-do-minutes-work-on-tracfone-android.html">How Do Minutes Work on Android Tracfones. You can also learn about http://stephaniefulke.blogspot.com /2015/08/how-data-works-on-tracfone-android.html">How Data Works on Tracfone Smartphones, and http://stephaniefulke.blogspot.com /2015/04/how-to-buy-only-texts-for-your-tracfone.html">How to Buy More Texts for your Tracfone. This is the list of Tracfone prepaid cell phones that come with Triple Minutes for Life. Found a triple minute phone that isn't listed here? Leave a comment so we can add it! To get more info on each of these phones, and read our reviews of them, simply follow the link for each one. Again, all of these phones come with Triple Minutes for Life! All Android Smartphones have Triple Minutes for Life - All of the recently released smartphones, like the http://stephaniefulke.blogspot.com /2014/10/lg-ultimate-2-l41c-tracfone.html">LG Ultimate 2, http://stephaniefulke.blogspot.com /2015/06/lg-power-l22c-tracfone-android-review.html">LG Power, and http://stephaniefulke.blogspot.com /2015/07/lg-sunset-review-tracfone-gsm-4g-lte.html">LG Sunset, have Triple Minutes for Life. So these are good options to choose if you're looking to maximize your minutes. Visit our http://stephaniefulke.blogspot.com /2014/07/tracfone-android-list.html">Android Phone List to see all the smartphones available with Tracfone. All BYOP Smartphones have Triple Minutes for Life - Any phone that you are able to use with the Tracfone BYOP program automatically gets Triple Minutes for Life! You can bring a wide variety of phones to use with Tracfone, and learn more about this on our http://stephaniefulke.blogspot.com /p/tracfone-byop-phone-list.html">Tracfone BYOP page. http://stephaniefulke.blogspot.com /2014/04/lg-306g-tracfone-review.html">LG 306G - One of the newest of the options listed below, this non-Android feature phone has a 3.2" touchscreen, GPS connectivity, and plenty of useful features. Might be your best choice if you're avoiding upgrading to a smartphone. http://stephaniefulke.blogspot.com /2012/11/tracfone-review-lg-530g.html" target="_blank">LG 530G - This phone comes with a great QWERTY keyboard making texting fast and simple. It also has lots of other good features like an MP3 Player, and long battery life. This phone has a solid construction and is very durable. http://stephaniefulke.blogspot.com /2012/10/tracfone-review-lg-800g-touchscreen.html" target="_blank">LG 800G - A slightly older Tracfone mobile device that features a touchscreen and many other good features. This phone, while not the best, can often be found at deep discounts and serves well as a back up or temporary phone. http://stephaniefulke.blogspot.com /2012/12/tracfone-review-lg-840g.html" target="_blank">LG 840G - A big upgrade from the LG 800G, this stylish touchscreen phone comes with WiFi and 3G connectivity making it a great value and one of Tracfone's best cell phones. This phone also comes with a MicroSD card, and lots more. Read our full review to see all the great features and the best deals. http://stephaniefulke.blogspot.com /2013/02/tracfone-review-samsung-s390g.html" target="_blank">Samsung S390G - This phone is another great option from Tracfone that comes with a QWERTY keyboard for fast texting, and WiFi connectivity for free internet browsing from the phone. Anytime you are connected to a wireless internet network, you can browse the web without using your prepaid minutes, adding huge value to this phone. Be sure to read our full review by following the link to learn more. http://stephaniefulke.blogspot.com /2013/03/tracfone-review-samsung-s425g.html" target="_blank">Samsung S425G - An updated version of the T404G, this phone features 3G connectivity making browsing the web faster and easier. It has a full sliding QWERTY keyboard that allows for fast and simple texting, and impressive battery life. http://stephaniefulke.blogspot.com /2014/06/moto-ex431g-tracfone-review.html">Motorola Ex431G - A cell phone built for texting, the Moto EX431 is fairly similar to the LG 530G listed above. It has all the basic features you expect, like MP3 Player, Voicemail and MMS. This phone can sometimes be found for less than $10, making it a great deal. But pay close attention because some versions of this device only come with Double Minutes. Learn more about the phones Tracfone offers by visiting our http://stephaniefulke.blogspot.com /p/cell-phone-reviews.html" target="_blank">Cell Phone Reviews page. And you might be interested in viewing the http://stephaniefulke.blogspot.com /2013/04/tracfone-cell-phones-with-wifi.html">phones from Tracfone that have WiFI. New to Tracfone? Start with our http://stephaniefulke.blogspot.com /2014/12/new-to-tracfone-start-here-tracfone.html">Beginners Guide to Tracfone which includes lots of helpful details and tips or you can also join our online community on Facebook! we feel the information Tracfone Triple Minute Cell Phones that's all. hopefully the information Tracfone Triple Minute Cell Phones that we have conveyed can provide benefits for you and all visitors of this blog, if any criticism and suggestions please comment. 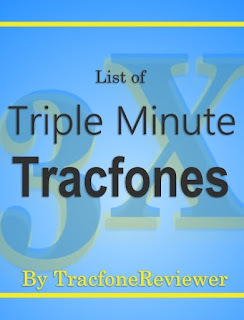 you just read Tracfone Triple Minute Cell Phones if this article is considered useful and you want to bookmark and share it please use the link https://stephaniefulke.blogspot.com/2015/09/tracfone-triple-minute-cell-phones.html and what if you want other information look for another page in this blog.